Actualmente tenemos localizadas 1 tiendas online donde podrás comprar este producto a precio rebajado y el mejor precio es de EUR 39,99. 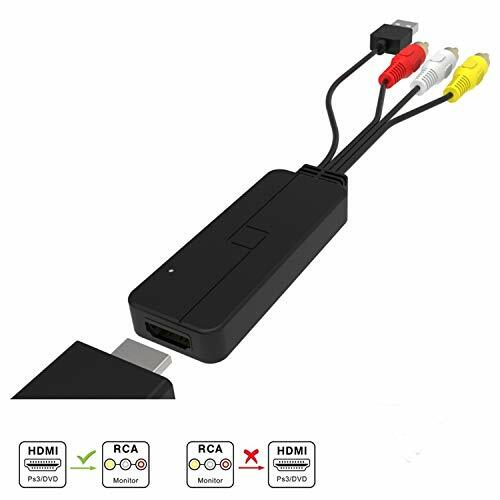 Comparte este producto con precio rebajado con tus amigos para que puedan aprovecharse de esta oferta y comprar CableDeconn HDMI to 3RCA Cable, HDMI to 3RCA AV Composite Video Audio Converter Adapter For Amazon Fire TV Sticks HD Player PC Laptop HDTV etc al mejor precio más barato que hemos encontrado para ti. 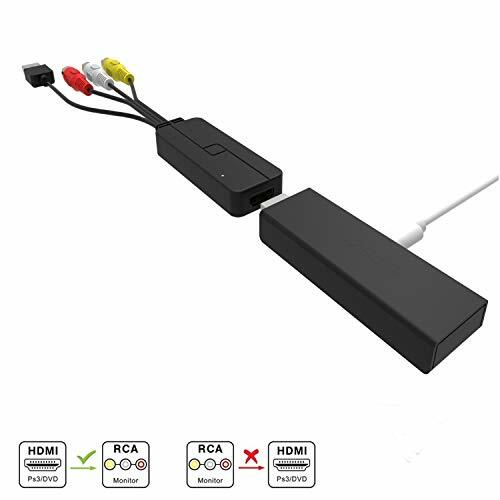 En nuestra web de rebajas hemos estado buscando todos los productos de CABLEDECONN y hemos encontrado, entre cientos de tiendas online, el precio más barato de este producto, CableDeconn HDMI to 3RCA Cable, HDMI to 3RCA AV Composite Video Audio Converter Adapter For Amazon Fire TV Sticks HD Player PC Laptop HDTV etc, que de entre 1 vendedores, el precio más barato es de EUR 39,99. Aprovecha esta oportunidad y siempre que necesites comprar online con ofertas, rebajas y descuentos, en De Rebajas sabes que siempre te vamos a mostrar el mejor precio. 1080P Video:Support Video output Max to 1080p in your output Compatible Device.Output the audio synchronization with the video.Note:If you would like to have 1080P video in your output device,you must be sure that your device is available for Resolution of 1080p. 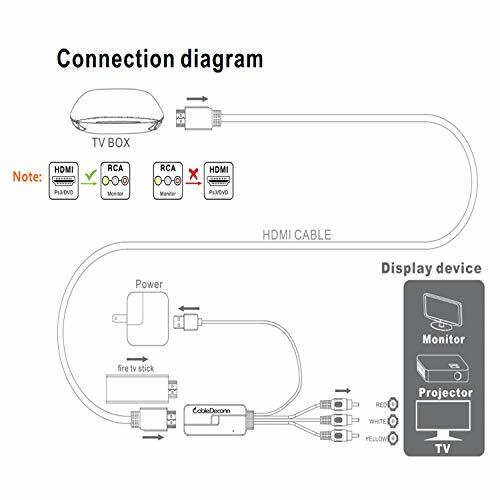 USB Cable for Power:This HDMI to 3RCA Cable equipped with an additional USB Cable.In case no signal detected,when you are using please connect the USB cable to your adapter or USB device for Power. Esay to use and portable: Well sized, no need to install drivers, plug and play, portable and flexible.Note:Only for HDMI to 3RCA Converter,can not be used as 3RCA to HDMI. 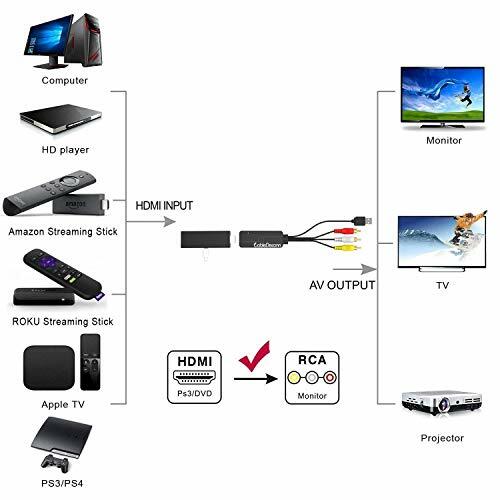 Widely Compatible Device:PS3, PS4, VHS, VCR, DVD, PC, Blue-Ray, Xbox One, Xbox 360, Roku Chromecast, Roku TV, Apple TV, Older TV, Smart TV, Monitor, Projector. 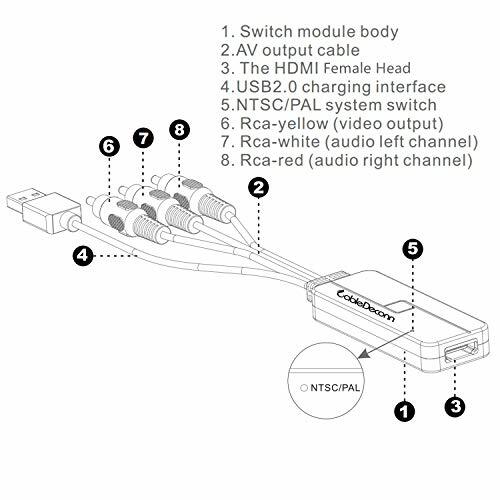 1:Connecting the HDMI female head of the product to your HDMI cable or tv sticks with HDMI Head. 2:ConnectING the other end of HDMI cable to your main input device,such as a PC,Laptop,Etc. 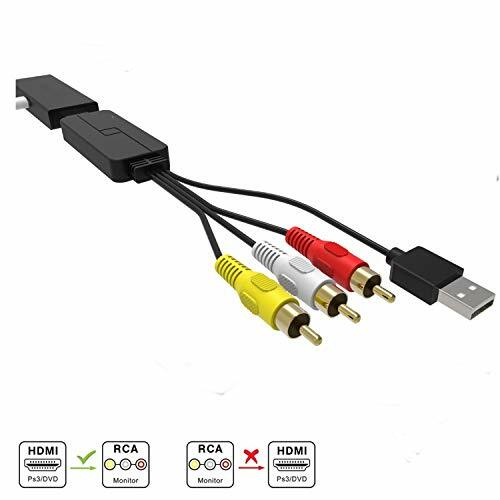 3:Connecting the 3RCA port of the Product to your tv,projector or monitor's Color corresponding interface.Yellow for Video Signal,White for left channel of audio and red for right channel. 4:Connect the product's USB port to USB devices for power input. 5:Remember to adjust the display port to the port signal input source you are connected to. 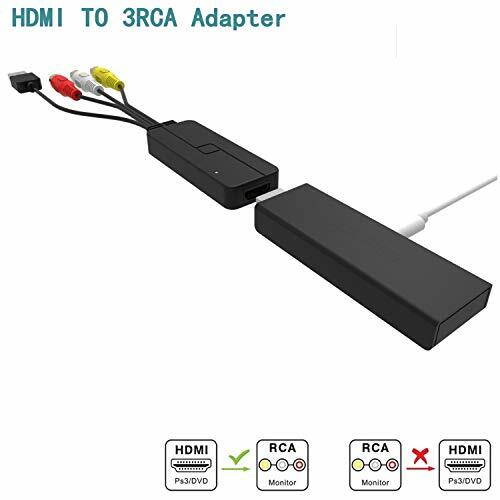 1:This cable is only converting signal from your HDMI device to your 3RCA/AV device,can n ot be used to shift video from your 3RCA device to your HDMI device. 2:Output the audio synchronization with the video only be available for your output devices supporting speaker and audio output. 18 Month worry-free warranty, Lifetime Technical Support,24 hr dedicated email customer support. En De Rebajas siempre buscamos el mejor precio, como este producto de CABLEDECONN, y te lo mostramos para que ahorres tiempo en tus búsquedas en internet para comprar cualquier producto de CABLEDECONN online.